Delhi Chief Minister Arvind Kejriwal called off the 30-hour protest (Dharna) outside Rail Bhavan on January 21, 2014 after few of his demands were considered. Arvind Kejriwal, Delhi’s erstwhile chief minister, gained popularity among the ‘aam aadmi’ – ordinary citizens – because of his tough anti-corruption stand. Many saw his newly formed party, the Aam Aadmi Party (AAP) as a breath of fresh air. His antics and strategies to grab media attention didn’t disappoint either. During his campaign for Delhi’s highest seat, he cut off electricity wires outside peoples homes to mark his defiance of what he said are corrupt electricity meters that overcharge people. Once in office, he sat in protest against Delhi’s own police force, demanding that the Central Government that controls the Police in Delhi, the country’s capital, immediately transfer its control to his government. Kejriwal has become an urban icon. Always wrapped in his trademark muffler, with a seemingly constant cough, his image is being parodied intensely on the internet. He insisted on being sworn in as Chief Minister of Delhi, in an open –to-all public function at one of Delhi’s biggest grounds instead of at the office of the Lt. Governor of Delhi, as is practice. For a while, he was adamant about holding a special session of the Delhi Assembly, called for legislating the Jan Lokpal Bill seeking to establish an anti-corruption ombudsman, in one of the capital’s largest stadium instead of inside the Assembly itself. On 14th February, after unsuccessfully trying to introduce the Jan Lokpal Bill on the first day of Delhi’s State Assembly, he held a press conference in the pouring rain to announce that he was resigning over this issue. This capped his 49 day tenure, and just before ending his press conference, he declared that che is ready to “sacrifice his life for the country” in his fight against corruption. In terms of theatrics that inescapably accompanies his politics, Kejriwal is caught the imagination of India’s common man. He is always on television. That any politician willingly resigned as chief minister will not be lost on Indians, used to seeing politicians hang onto power with dear life. 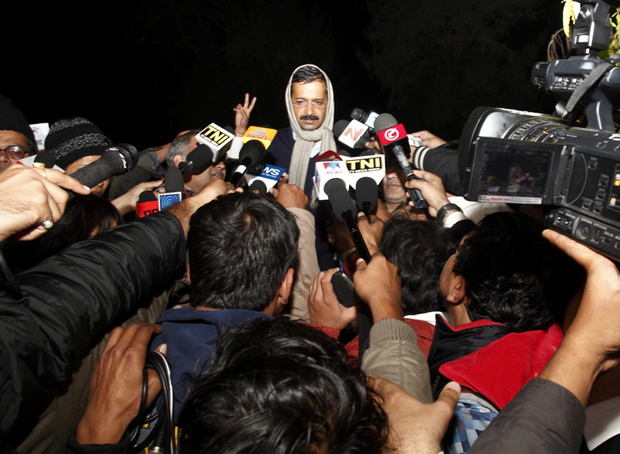 Many are looking to Kejriwal to make a sizable dent in the national elections, projected to be held in April 2014. While campaigning and during this term in office, Kejriwal unveiled an arsenal of ideas to battle status quo – and take on people in authority head on – including his idea of asking the common man to use the mobile phone as a “weapon” to secretly film government and police officials demanding bribes. This proof then could be turned over to his government, which had set up an exclusive hotline to deal with corruption charges. Don’t get mad, get even – seems to be his motto as he urged residents of Delhi, “setting kar lo” – or fix them. Media reports confirm that as a result of “open season on sting operations” the sale of spycams have increased in Delhi, with some shopkeepers estimating that the sale of these hidden cameras have shot up almost 90%. Spy cameras are available in the form of pens, keyrings, buttons, watches, pen-drives and eyeglasses, and on a more expensive scale, in jewellery and other bespoke items. This isn’t the first time AAP has recommended the use of spycameras. Days before the New Delhi vote, the media reported that AAP were fitting slums with spycams to ensure that candidates of other parties did not go there to try and buy votes – and if they did – they would be caught. Over 2,000 spycams were reportedly used for this operation. The AAP party is not the first — and certainly won’t be the last — in suggesting the use of cameras, especially through mobile phones, for citizen empowerment. In fact, when Delhi’s traffic police first launched a page on Facebook, citizens began posting pictures of cops breaking traffic laws in hopes that they be reprimanded. Similarly when the Municipal Corporation of Delhi started its Facebook page, people took advantage of the platform to post pictures of shoddy or incomplete works in their neighbourhoods. Community video project, India Unheard, has armed citizen journalists from small towns and villages with cameras, and they report on development and other issues, and publish these videos on the internet. In many areas, due to the spotlight on them, government officials have responded to these negative reports and taken action. The parent outfit, Video Volunteers, even ran a campaign to check the “real” progress of India’s Right to Education Act, by bringing out over 100 videos that document the real implementation of this act on the ground. The use of technology “from below” to hold those in power accountable is also known as sousveillance, a word that comes the French word “sous” (from below) with the word “viller” coined in 1998 by Professor Steve Mann of the University of Toronto. In the West, sousveillance is being looked at by some as an foil to mass surveillance; a manner in which citizens can watch those watching them. Others, however, express some doubts at a society where citizens are pointing cameras at a state that is watching them, and perhaps ultimately leading to a situation where everyone is watching each other. Surveillance is normalized because it is so institutionalized. However, sousveillance is not necessarily targeted towards government and law enforcement officials alone. In New York, a project called Hollaback asks women to take pictures of their harassers and upload it to their site. The movement has expanded and extends to Indian cities as well. And gadgets like Google Glass will make humans capable of recording their perspectives on a 24/7 basis, amassing huge data. So it appears that at a time when civil society is up in arms against big brother surveillance schemes run by the government because of their privacy breaches, we are simultaneously doing the same to ourselves, with what some call little brother surveillance. Jay Stanley, Senior Policy Analyst at ACLU writes, “Under the old expectation, the default expectation was that any given event would not be photographed… That is rapidly being replaced by a new mindset in which the default expectation is that something taking place in public will be recorded. Thus you often hear expressions of disappointment when a disputed or dramatic public event is NOT caught on video.” He also raises the point that citizen video footage might give the state a reason to scale down their mass surveillance activities, because video evidence can simply be collected from private photos and videos. However, it seems unlikely, given what we know about governments world wide, that most countries will be ready to give up their schemes to the off-chance that somebody-recorded-it. The truth is that India has a problem of entrenched corruption, and the AAP’s ride and subsequent anti-graft ideas address these concerns head on. Previously India’s Central Vigilance Commission in 2010, had encouraged people to conduct stings on government officials, even as a draft privacy law, yet to be passed by the Indian parliament, said such operations could violate individual privacy. Others worry that programs like these need protections such as a Whistleblowers Act and provisions to protect anonymity. However, the concept of sting operations, made popular by a vigilante media has become so popular that there is now an Indian website that collates India sting operations for anyone to see. The government of India’s capital is installing more and more CCTVs for safety reasons, the Central Monitoring System is being deployed to track citizens online behavior, and now the Delhi government is glorifying sting operations through radio ads and billboards. Ultimately, the AAP, consciously or unconsciously, has given its vote to a society based on sousveillance. Can the encouragement of spycams and secret mobile tapings end up in people spying on neighbours, and perhaps even blackmail them? Could Delhi’s public spaces shrink because of the “spycam moral police”? Are adequate privacy frameworks in place? The AAP needs to think about these questions, especially if it plans to field these ideas during the national election campaign trail. Point and shoot are never orders to be given lightly.